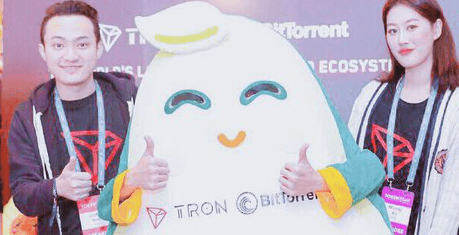 An analysis of 50,000 new Twitter followers of Justin Sun, Tron’s founder, reveals about 20,000 of them are zero day accounts created this month with almost no followers or tweets. 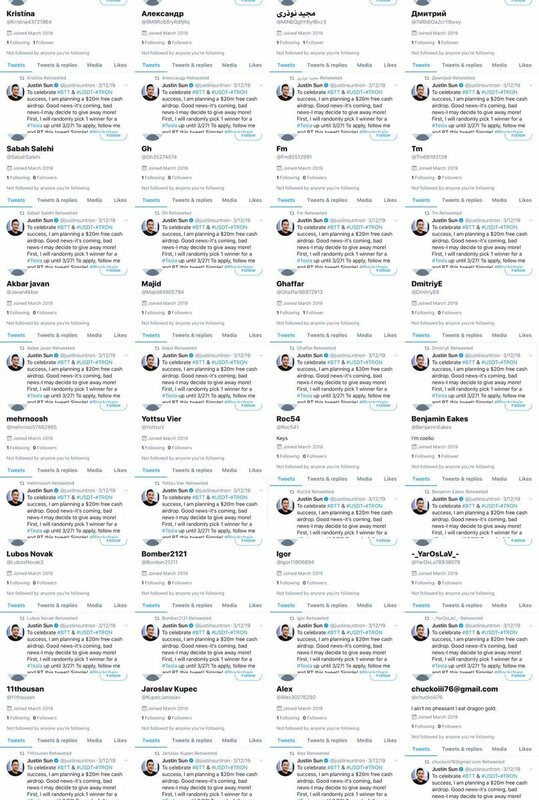 Probable fake Twitter followers of Justin Sun, Tron’s founder, March 2019. You can see they’re all newly created accounts with many of them having eight numbers after their “name,” something which could suggest they’re mass created by some software. 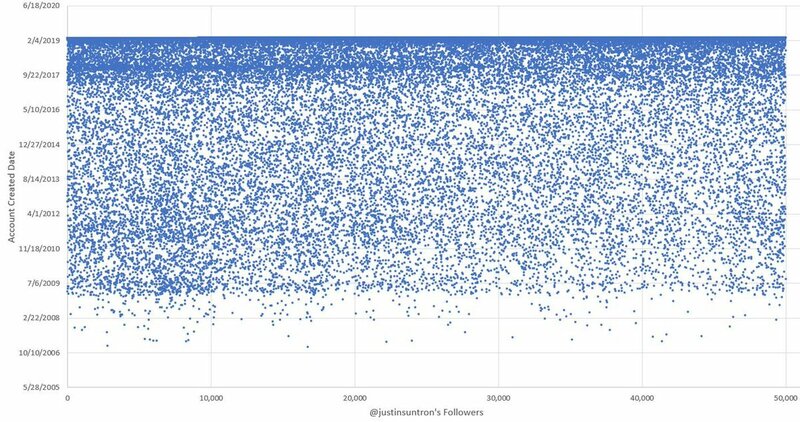 Justin Sun recent followers by date created, March 2019. You can see 2019 is deep blue, suggesting tens of thousands of accounts were created just this month and they happen to follow Justin Sun who recently bragged of passing one million followers, more than eth’s inventor, Vitalik Buterin, or any crypto account. 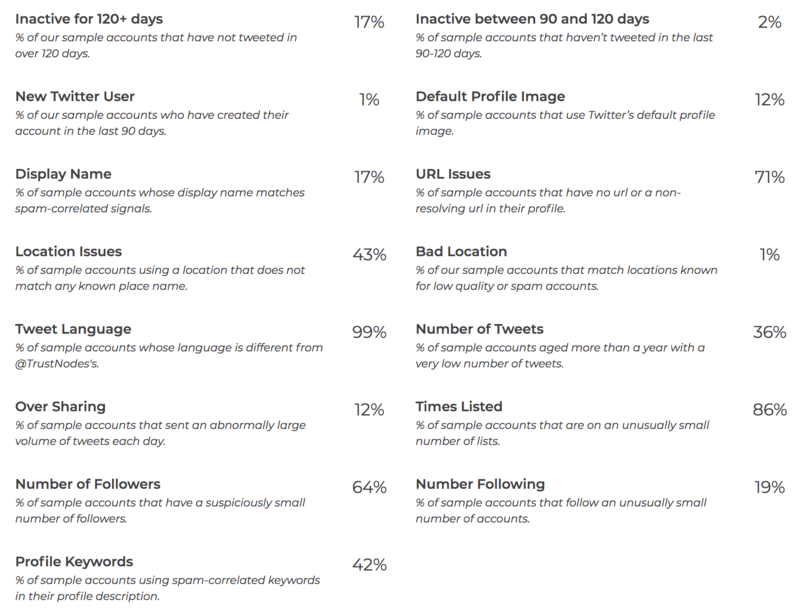 Justin Sun’s Twitter followers audit, March 2019. 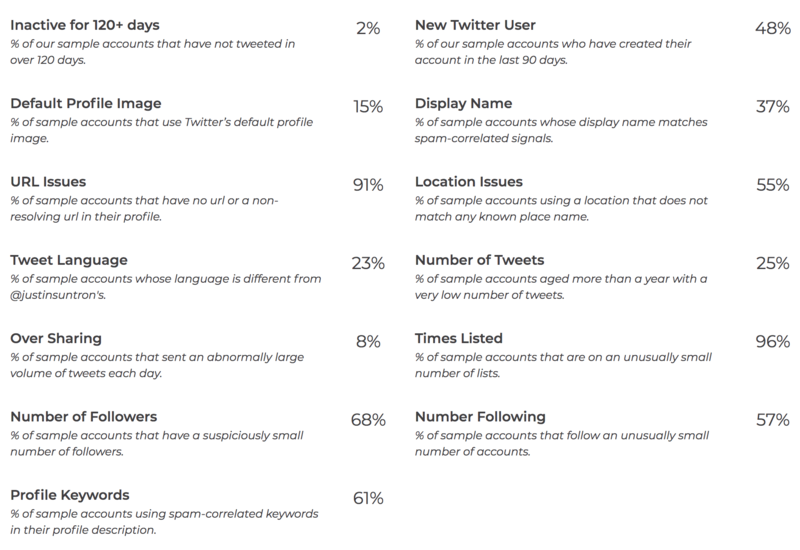 We have some 90% of accounts with URL issues and close to 70% with “suspiciously small number of followers.” In addition, about 50% are quite new, created in the past three months. 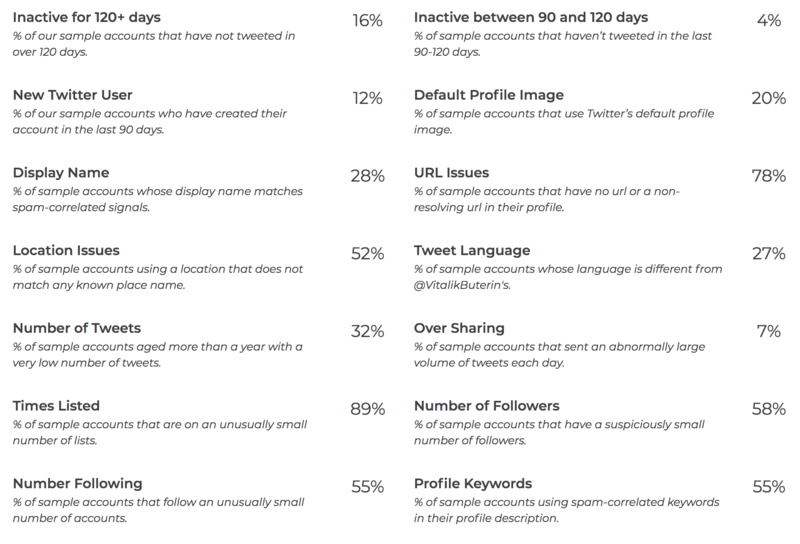 Another potentially revealing fact is that close to 60% are following very few people. Trustnodes’ Twitter followers audit, March 2019. Apparently a lot of our followers use spam keywords on their profile, whatever that means. An incredible 99% have a language different from Trustnodes, which is obviously incorrect. Most of them do use English, although of course cryptos are global so there are followers from across the world. Other factors that probably can be discounted includes location issues, that is people saying they live on Mars with Elon Musk. URL issues obviously doesn’t say much. Times Listed… who even uses lists? And probably number of followers doesn’t say much depending on at just what level they deem them suspicious. What is revealing is the date the accounts were created. For Trustnodes, only 1% of them are new. For Justin Sun it is close to 50%. Another factor might be just how many people these accounts are following. Naturally an account might have few followers, but if they’re participating on Twitter you’d think they’d follow quite a few people. Unless they are bots intended to inflate numbers to give a fake impression of street cred, in which case they might not follow many at all. Finally another factor might be the number of inactive accounts. You’d expect a reasonable proportion to not tweet that much or generally be passive. For Justin Sun, just 2% have been inactive for more than four months and effectively all his followers have been active between 90 and 120 days. For Trustnodes, it’s 2% for the latter, and some 17% haven’t participated much for the past 120 days. Vitalik Buterin’s Twitter followers audit, March 2019. Looking at this, as you’d expect the most relevant indicator appears to be just how old are the accounts and perhaps counterintuitively just how many of them have not been active over some period. There’s plenty you can do to game both factors and in this cat and mouse game we’ll probably see more sophisticated bots, but presumably such bots would be more expensive and not quite available on demand in huge numbers. That’s because there obviously are old accounts that clearly appear to be fake. Golberg highlights one of them. Where it’s at the scale of tens of thousands, however, or perhaps even hundreds of thousands, such long term fake accounts might not quite be available in sufficient numbers. Twitter is much to blame for their willful intentional failure to remove these bots. As this space well knows, they allowed literal scam accounts to run amok for months on end with no action taken until a crypto dev begun sharing a tool to automatically block these accounts. At that point, it became untenable for Twitter to not adopt this tool themselves after it was shown just how easy it was to take appropriate action at scale. Here too, if a researcher can identify these obvious fake bots after some analysis, then it isn’t clear why Twitter can’t. There are suggestions they want to inflate their numbers, which itself is manipulation and suggests they condone this deception of the public.